Above: The Roman Catholic Church of the Holy Trinity, set on a hilltop in suburban Liesing, at the edge of the Vienna Woods. 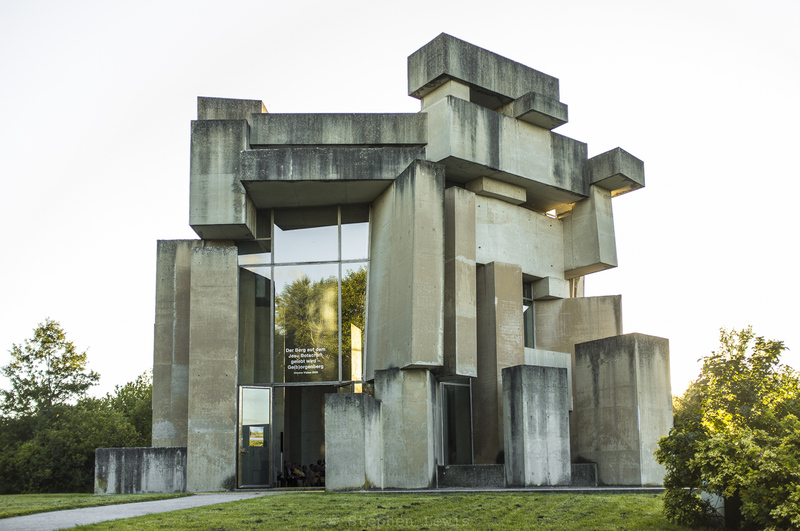 The church is popularly called the Wotruba Church, after its designer, sculptor Fritz Wotruba, who died one year before the structure, comprised of more than 150 massive concrete blocks, was completed in 1975. Despite their weight, the blocks comprising the Wotruba Church appear to float, and the large glass windows on three sides of the church give the building a gossamer appearance usually not associated with concrete structures. When circumnavigating the exterior of the church, visitors are treated to a kaleidoscopic view of seemingly random shapes and plays of light that appears to change with each step. The front lawn of the church offers a spectacular panoramic view of Vienna and far beyond, northwards, to the Marchfeld, the great Moravian plain. Two curious footnotes: Between 1938 and 1945, when Austria comprised an integral part of Nazi Germany, the hilltop upon which the Wotruba Church stands had been the site of a Wehrmacht barracks, making the envisioning and building of the church an act of expiation of sorts (to the degree that expiation for past violence is possible). Also, one of Fritz Wotruba’s early pupils, sponsors, and lovers was Anna Mahler, the daughter of Gustav Mahler and Alma Schindler, Mahler’s wife at the time and, later, the wife of Walther Gropius and, subsequently, of Franz Werfel. Below: A partial view of but one of the immense apartment blocks comprising Wohnpark Alterlaa (the Alterlaa Housing Estate), also at the edge of Vienna, designed by architect Harry Glück and built in the late-1970’s and early-80’s. The saw-tooth design of the windows on the upper floors ensures that apartments are filled with light throughout the day. 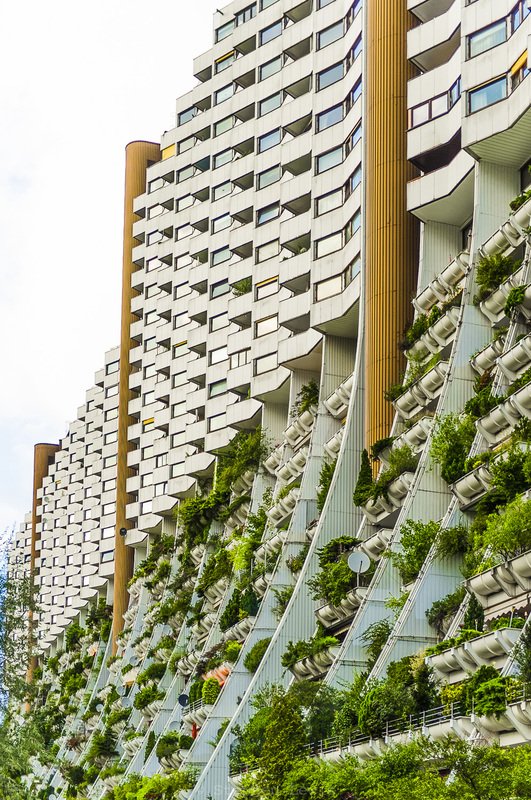 The curved set-back of the lower floors ensures ample sunlight and rainfall for nourishing balcony gardens and also creates a lush hanging-gardens-of-Babylon-like appearance that offsets the deliberate roughness of the concrete exterior. Despite its seeming inhuman scale, the results of sociological surveys and anecdotal inquiries suggest that the Alterlaa complex is beloved by its residents. Echoing the tradition of Viennese public housing implemented by socialist “Red Vienna” between 1919-1934, the complex contains social amenities: rooftop gardens, ample meeting and club rooms, swimming pools and sports facilities, nurseries and kindergartens, and even its own church. Grounds between the towers are landscaped and well-lit, and shopping and public transport are nearby. In all, there is a feeling of community among the residents of Alterlaa. The positive side thereof is that the physical attributes of the complex seem to have indeed succeeded in their mission of creating appealing private and public space. Also, the relative isolation of the site fosters self-containment. But, there is a more problematic side: Whether and to what degree the relative homogeneous demographics of the Alterlaa estate may have contributed to the satisfaction of its residents. Unlike the great working-class public housing complexes of 1920s and early-1930s Vienna, Wohnpark Alterlaa is a cooperative, rather than a municipal, housing development. The economics of cooperative apartment ownership skews the demographics of Alterlaa middle-class-wards and, thus, in terms of the class and ethnic matrix of Vienna, “ethic-Austrian-wards” as well. It is an open question whether such relative class and ethnic homogeneity eased the way to community or, more negatively, to a “bastion mentality” fostering solidarity and contentment in the face of perceived external threats. These, however, are matters for investigation by the experts. Afterthought: For the tragic saga of a paradigmatically unsuccessful municipal housing project conceived in the racist, class-ist mold of 1950s and 60s urban renewal as practiced in numerous American cities (and designed by the future architect of the Port Authority of New York and New Jersey’s World Trade Center in Lower Manhattan, mourned since its criminal destruction in 2001 but a resounding and resented flop in its early years) see the excellent documentary film The Pruitt-Igoe Myth.